He's done everything in hockey except win a Stanley Cup. Can Jarome Iginla take his Flames to the promised land in 2012? By signing five d-men including Scott Hannan, the Flames are making a statement about the state of affairs in Calgary. The Flames looked ready to compete towards the end of last season. A sign of good things for Kipper? Jarome Iginla, RW: Either he had a blip in his career in 2009-2010 or he was sipping on the Selanne juice last season. Either way Iggy is a lock for 80 points and 35-40 goals in Calgary. He doesn’t start very hot, but once he breaks out he’s the best in the business. Now that Calgary locked up Alex Tanguay, Iggy will be a happy camper. Alex Tanguay, LW: He plays every shift together with Jarome and he’s the best French-Canadian winger in the game. 70 points is automatic. 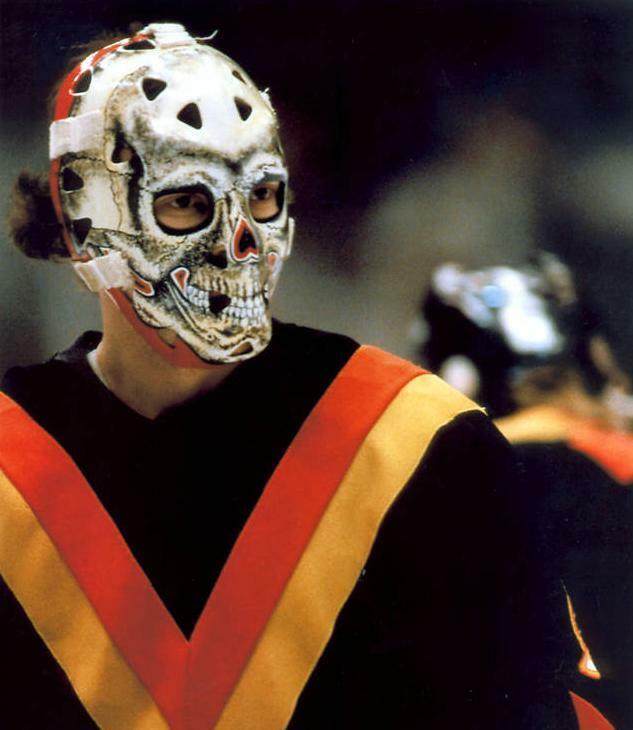 Mikka Kiprusoff, G: I have no idea who has played backup in Calgary since this guy got there. The Flames would be nowhere without his work. He’s an elite goaltender who averages the most GP’s in the league. He’ll get every Flames win, but he’ll get a fair share of their losses too. Maybe they won’t have many this season though? I think he’s good for 40+ this year. The hulking Babchuk will be a force in Calgary for the foreseeable future. Rene Bourque, RW: Has good enough speed and shot selection that he should be a guaranteed 50 point producer for the next 4 years. He is expected to do a lot of checking so his offense takes a hit. An excellent second liner for any team and good enough for a late pick for yours. Mark Giordano, D: Anytime you get a chance to pick up a 40 point D-man, you should consider Giordano. He’s very underrated as a puck-mover and is pretty solid all-around. Anton Babchuk, D: Not that you should spend a pick on this giant from Kiev, but the Flames really like his work ethic and the fact that he has a KS-30 for a shot. He had 35 sneaky points last year. I expect that number to blow up to 50. Keep an eye on Babchuk. Olli Jokinen, C: At this point, he is what he is. Between the NHL and the National Finnish team, he has played a lot of hockey over the last 15 years or so, but he’s a favourite of Iginla’s so the Flames keep him around. He stays pretty healthy, which is the frustrating part because of his talent level. Don’t expect him to reach anywhere near a point a game and you won’t be disappointed. a 50 point centre these days is what you get from Olli. Brendan Morrisson, C: Another 40 point season because he won’t play the full 82 games anymore. If they make playoffs then take him in a playoff pool. The Flames will need contributions from everybody, including Curtis Glencross, in order to make playoffs. Claude Lebut says: A lot of experts are predicting the Flames to tank again next season but I think there will be a different culture on the team this year. Iginla knows his time is running out and he can’t keep starting so slowly anymore. Team chemistry looked great last year towards the end of the season and even Jokinen played quite consistently. Kiprusoff is still an elite goaltender, maybe the most underrated in the league and the signing of Babchuk to a new deal will help keep some pucks out of the net. They still have work to do with the D, but up front they seem to have a couple of solid lines even if their centre position is a bit old. I think this team can win 40 games and sneak in there for a playoff upset. Hattrick Payne says: I might be tempted to agree with Claude here and predict playoffs for the Flames, going against conventional wisdom. Here’s a team that knows its time is overdue in the sense that a GM was fired last year, and so players are sure to be next. They showed later in the season that Sutter wasn’t the problem and played good hockey for well over 3 months, nearly securing a playoff spot last season. I expect we’ll see that team come out of the gates, and push the Canucks for the division lead as they have done for the better part of a decade or so. Iginla has too much pride to let anything else happen. Gut instinct tells me the Flames make the playoffs again. Mark Twain says: Words are only painted fire; a look is the fire itself.